Overfitting is a key characteristic for regression style data modeling with deep neural networks. Whereas considerable effort have been devoted to finding methods to reduce overfitting, little have been done to address the question how to measure overfitting. In most cases, overfitting is measured by prediction error with respect to a pre-selected test data set. Such method has led to various, more or less, successful overfitting-reducing techniques. There are, however, some open questions relating to the rather ad hoc method to measure overfitting. Firstly, the method requires that the test set does not participate in the training process. But most learning process checks repeatedly with the test data set to find optimal models or meta-parameters. In this way, the test data set information "leaks" in to the training process and compromises the separation between training and testing data set. Secondly, there are no clear guidelines to choose the test data set. The method implicitly assumes that the randomly selected test data set will reflect the intrinsic statistics of data model, such assumption can be far from being true in the practice. Thirdly, many problem encountered in the practice have rather limited data, reserving part of the data as test data set might significantly reduce the size of the training data set, and therefore reduce accuracy of regression.model. Strip Overfitting with respect to point A and B. The above diagram shows a neural network involved in learning a map from high dimensional data set to the 2-dimensional plane. 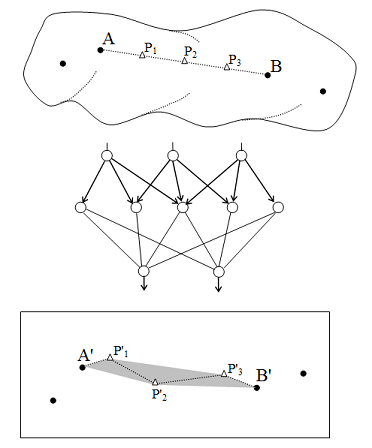 After completed the learning process, the network maps the two data points labeled A and B to A' and B', respectively. In order to measure the overfitting, we choose 3 evenly distributed linear interpolation points between A and B; and calculate their targets in the 2 dimensional plane with the learned network. Whereas A, P1, P2, P3, B form a straight line, the points A', P'1, P'2, P'3, B' normally don't form a straight line. We then define the strip overfitting w.r.t. A and B by the size of the strip induced by the points A', P'1, P'2, P'3, B', as depicted in above diagram as the shadow area. Based on the strip overfitting for a pair of data points, we can then estimate the overfitting for the whole training data set by the average strip overfitting for a fixed number of randomly selected data point pairs. It should be noted that the number of interpolation points provides a way to control the scaling of the overfitting: the more interpolation points we choose, the finer the strip and the smaller the strip overfitting. When the target space is a one-dimensional space, the strip will collapses to a straight line and always have size zero. In order to accommodate such special case, we append an index component to each value in the series A', P'1, P'2, P'3, B', so that we get a series of two dimensional vectors (A',0), (P'1,1), (P'2,2), (P'3, 3), (B', 4); and we define its strip size as the strip overfitting for the one-dimensional target space. It should be noted that the strip overfitting also becomes zero, if the mapping induced by the network preserves straight lines between the data points. That means, linear regression would be considered as kind of ideal regression with zero overfitting. Since most data models in the practice are non-linear, zero strip overfitting won't be achieved globally for all data point pairs. 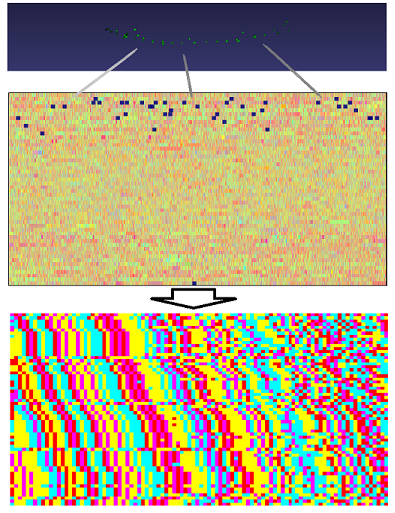 The interpolation technique also provides a direct way to visualize data generalization. In order to see how a neural network generalizes, we can choose two data points and calculate a series of interpolation points between them; and then plot their trace mapped in the target space by the network. As samples, the following two pictures show the traces of three pairs produced by two differently trained neural networks: both networks have the same structure and are trained with the same algorithm, the only difference is that the network that produces the left picture has used the dropout regularization technique to reduce overfitting. We see clearly that the three interpolation traces on the left side are closer to straight lines. Numerical calculation also verifies that the network for the map on the left side has smaller strip overfitting. This example indicates that strip overfitting as defined in this note may be suitable to characterize overfitting phenomena. The next two pictures show more examples of interpolation traces that visualizes the effect of dropout regularization technique. These two pictures are produced by the same two networks used before with the exception that here more data point pairs have been chosen and the training data points are not shown for the sack of clarity. We see that the dropout regularization makes the interpolation traces smoother and more homogeneous. This note has introduced the concept strip overfitting to quantify overfitting in multidimensional regression models. The method basically quantifies overfitting by the "distance" between a regression model and the linear interpolation. We have demonstrated with examples that the strip overfitting may be suitable to measure and compare the effect of regularization techniques like dropout technique. The strip overfitting offers an interesting alternative tool to quantify and visualize overfitting in neural networks for multidimensional data modeling. Line chart is a popular technique to visualize trend among sequential data. Whereas it has been very a useful tool in general, it has a often neglected problem for large data sets: most conventional software library draw curves sequentially in certain order, so that the early drawn curves will be covered by curves drawn afterwards. This means that the appearance of the line chart depends on the drawing order, that is often random in the practices. The following animated picture illustrates a case where yellow curves get covered by blue curves. This drawback would especially become more apparent for large data set that comprises many high density curves. Input: A set of line segments each with 2 ending points and a color. 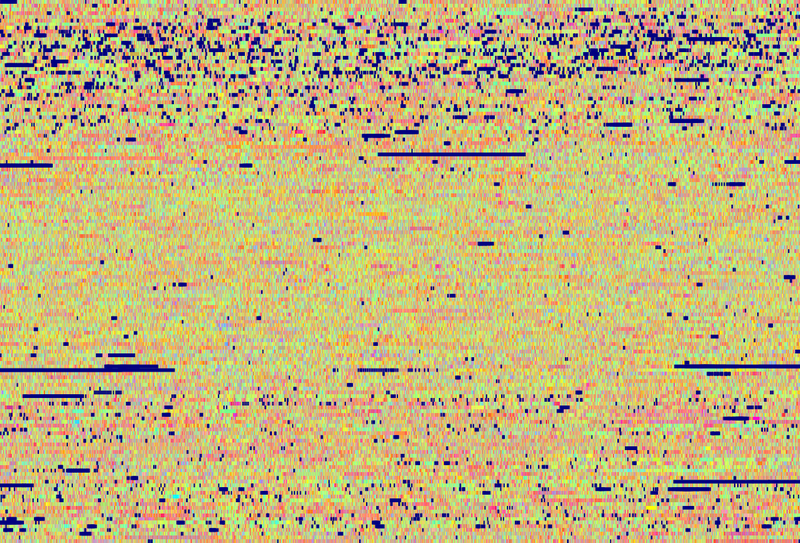 Output: A bitmap P with a color Pxy at each coordinator (x, y). Initialize P with the background color. The above algorithm is a single pass drawing method where each pixel color of a line segment is directly painted on the bitmap. With this method, painted lines on the bitmap may potentially be painted over by successive lines. each component of M holds an integer vector Mxy=(r,g,b,n). Compared to the previous method, the key change of the new method is the use of an intermediate matrix : the matrix sums up all colors from all lines and counts how many times a pixel has been painted. In the second pass, the matrix is converted to bitmap by taking the "average" color for each pixel. It should be pointed out here that, for an actual implementation, the data type for matrix components should be all 32 bits integers, so that no data overflow occurs when summing up the colors. We see in above picture that the group of yellow curves are clearly visible. In general, the new line chart will reveal groups of curve, as long as the group is statistically significant with respect to the complete data set. The conventional line chart, on the other side, only shows curves on the "surface" of the curve bundle. The new line chart algorithm has another significant advantage over the conventional line chart: since the algorithm does not mandate particular order to update the matrix and bitmaps, it can be efficiently parallelized on modern GPU hardware and achieve very good performance. The implementation included in VisuMap version 5.0.930 is, for a system with a GTX 960 card (that has ca. 2000 GPU cores), more than two orders of magnitude faster than the conventional line chart. 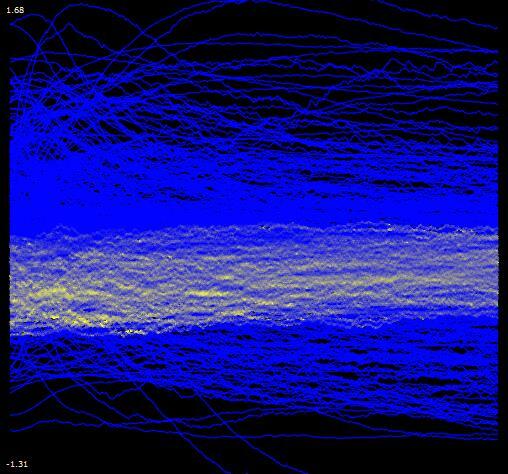 Data profiling are normally understood as statistical methods to extract numerical features from complex systems for easy exploration. So for instance, GDP, CPI and various kind of indices are often used to profile the state of an economy. Appropriate profiling helps us to compare similar systems; or a system in different development phases. In this note I'll put forward a generic method to profile high dimensional data; the method combines dimensionality reduction algorithms with deep artificial neural networks. Above map was made with the tSNE algorithm from a dataset that contains about 6000 data points each with 12 variables; The colors for the sub-clusters are added with help of the affinity propagation clustering algorithm. The colored map is pretty helpful to discern interesting structure within the data set. Unlike those statistics based profiling, the visual map based profiling does not rely on high level features like GPD ratio; which in general require a good understanding about the data and underlying system. Nevertheless, those visual map based methods lack the predication capability in the following sense: in the practice, we often have multiple data sets collected about similar systems, or the same system in different phases. For instance, in clinic trials our data sets might be gene expression profiles of patients in different trial stages. In these cases, we are especially interested in differences between the profiles. Most of these NDR methods are however insensitive to small changes, so that it is hard to recognize differences between NDR maps from similar data sets. The DDP procedure starts with a set similar data sets. As first step we choose a reference data set and apply NDR on the data set to obtain a 2D or 3D map. Many NDR methods are available for this purpose, for this note we recommend the tSNE algorithm, as it is widely available and produces relatively good structured map for a wide range of data. 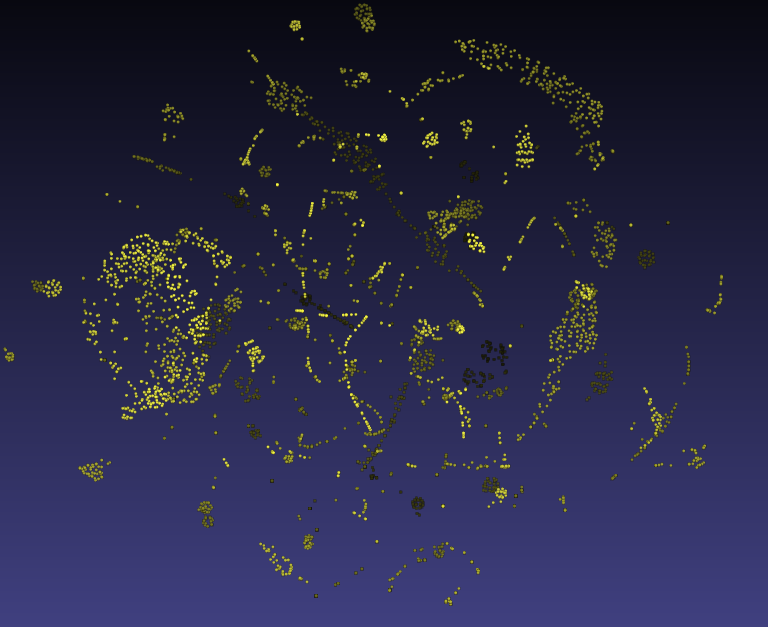 Then, we apply a clustering algorithm on the map to produce labels for the sub-clusters on the map. Those labels are then used as different colors for the sub-clusters, so that we get a colored map as illustrated in above picture. There are many clustering algorithms suitable for this purpose, for this test we used the affinity propagation algorithm together with some manual adjustment directly performed on the map. The colored map we obtained from the reference data set represents knowledge we captured from the reference data. As next step we then use a machine learning algorithm to learn such knowledge. In particular, we employ multilayer feed forwards networks to learn the translation from reference data to the colored map. Two networks will be used for this purpose: one to learn the dimensionality reduction function; and the other one to learn the clustering function. The two trained networks can then be applied to other data sets to produce colored maps as their visual profiles. Deep data profiling procedure presented here offers a visual profiling technique for high dimensional complex data. Compared to conventional statistics based profiling techniques, DDP is more intuitive and information richer. 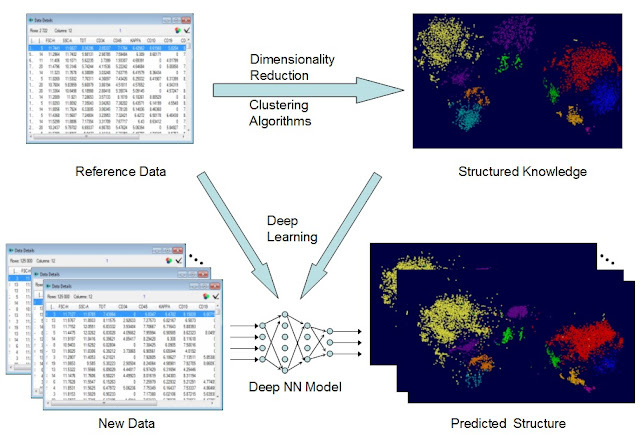 As an meta-algorithm, DDP can take advantage of new algorithms for NDR, clustering and machine learning. With the rapid development of machine learning technologies, DDR might offer powerful and versatile tools to explore high dimensional complex systems. Genomes of multi-cellular organism often contain short sequences with many duplicates which have been created and preserved with minor mutations during their evolutionary processes. Those nucleotide sequences, called here generically motifs, carry important information about the structure and history of those genomes. Better understanding of those motifs could help us to explore the function and evolutionary path of genetic code. In this note I'll put forward a method to visualize motifs as 3D dotted maps, where each motif is represented by a dot in the 3D space; and sub-groups of motifs may take different shapes, which I'll try to interpret in terms of evolutionary variations. I have put forward some methods to visualize DNA sequence a while ago. In those early attempts, different scanning machines were used to extract high dimensional vectors from DNA sequences; which are then mapped into 3D space with multidimensional scaling algorithm. A main problem of those methods is that they are often not very sensitive towards sequential variations, so that the resulting maps lack capability to reveal structural information. The method presented here basically follows the same framework, except that we'll not use scanning machine, but feed the motif sequences as data points directly into the multidimensional scaling algorithm which uses the neadleman-wunsch algorithm to calculate the editing distance between the motifs. In the following I'll use the chromosome I of Caenorhabditis Elegans as an example to detail the steps of the visualization process. Assuming that all motifs are created by duplication and random single nucleotide mutations, we could interpret above shapes as following: Motifs form shape of small blobs indicate those motifs originated from a common ancestor and have undergo minor mutations. Those motifs could be either recent duplicates, so that they don't have time to accumulate large number of mutations. Or, if they exist for long time, their mutation with large number of mutation did not survive the evolutionary selection process. In above pictures, the top picture shows a section of the 3D motif map; the second picture shows corresponding locations of those motifs on the chromosome. With VisuMap you can interactively move the selection of motifs in the window displaying the first picture, so that the second picture will mark the location of selected motifs. The last picture shows the nucleotide sequences of these motifs, one motif per row, in the order along the curve from left to right. We can see that these motifs gradually shifted their phases. We notice some curved motif groups have small blobs attached to them. These blobs might indicate short bust of different mutations. 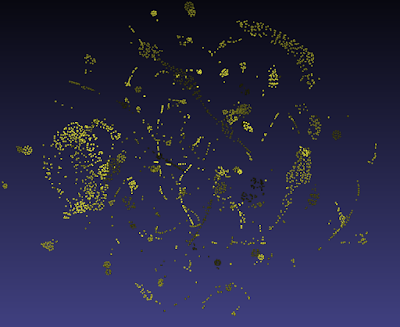 Interestingly, we see two motif clusters in the 3D map which form roughly two parallel rings. Those motifs are distributed across the whole chromosome, they may have some internal relationship, but I'm not sure in moment how to interpret them in terms evolutionary process. It should be noted that for the human chromosomes, calculating the motif map with the current implementation for all motifs would be computationally prohibitive. So, I used a simplified version of blastn; and selected three small sub-sets, each with about 20 000 motifs, for above motif maps. The three sub-sets have increasing duplicate frequencies. So, for instance, motifs of the third set all have over 10 000 duplicates; whereas the first set has motifs with 300 to 500 duplicates. From above maps we can see that the motifs of rice genome are much less structured: almost all of them are just small blobs. Those motifs are, unlike the case with C. Elegans, mostly located in coding area. 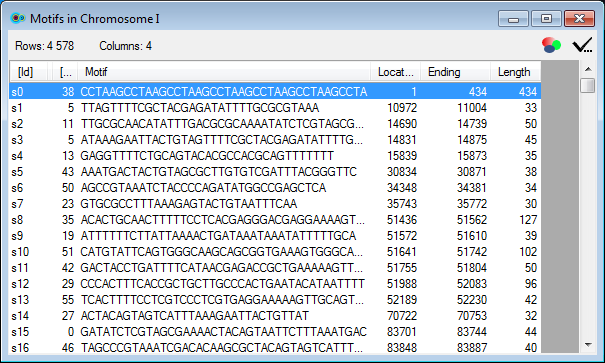 On the other side, the motif map of the human genome shows diverse structures depending on the duplicate frequencies; and the third motif map evens shows some kind of 2-dimensional structure. 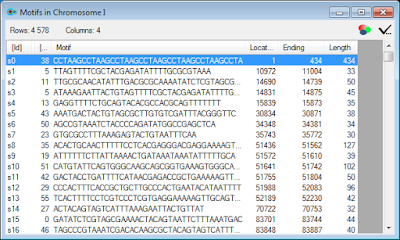 The visualization method presented here provides a simple way to extract geometrical models from pure discrete genetic sequence information. These geometrical shape provide intuitive information about the evolutionary path of genetic code; and they might be helpful to profile and explore whole genome structures. The method presented here has three key components: the way to find motifs; the way to calculate editing distance and the multidimensional scaling algorithm (MDS). Each of these three methods has significant impact on the results and they also pose significant limitations. For instance, the current implementation of these components are quite slow, so that it is difficult to visualize large motif sets. I have experimented with other editing distance, like the smith-waterman and levensthein method, they seem to perform similarly, needleman-wunsch just produces slightly better visualization. For the future investigation we might work on finding more efficient MDS algorithm or finding more efficient distance metric to help us to attack much larger and different groups of genetic code.